Lucifer focuses on Ella as she struggles to decide if she should return home when her family asks her to or stay in L.A. where she is comfortable and happy. Fans of Lucifer are given an unexpected treat in the form of two bonus episodes apparently intended for the fourth season. Since there won’t be one Fox has opted to air them as bonus episodes so that fans won’t miss out on a final opportunity to experience the show that they sadly have to say goodbye to. There is still hope that it will be picked up elsewhere but until that actually happens I’m operating under the assumption that it’s over. The first of these bonus episodes is an Ella centric episode and it appears designed to pretty much fit in anywhere since Ella’s introduction in the second season. Like many episodes of this show it uses a murder investigation as a way to explore issues pertinent to the characters. In this case Ella has been asked to return home by her family and clearly doesn’t want to but also feels bound by a sense of familial obligation meaning that it isn’t as simple as deciding not to go back. Her arc is focused around exploring the life she has built in L.A. and the meaningful relationships she has forged. She spends a lot of the episode apart from other members of the cast but the exploration is more internalised with input from Chloe and Lucifer when it becomes important. After the game changing season finale it’s smart to keep things vague in terms of placement. Lucifer and Chloe only interact in one scene and there’s nothing specific about the episode that places it during any particular time frame. Focusing on Ella is a good way to do this as it gives Aimee Garcia an opportunity to carry an episode without the baggage the other characters bring with them. 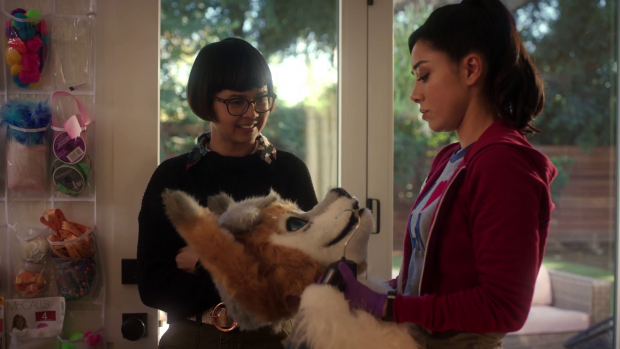 She shares a lot of her screen time with a Ghost named Ray Ray (Charlyne Yi) who can only be seen by Ella and is heavily implied to be a figment of her imagination. The episode employs the usual tactics to hint at this such as Ella being the only one who can see her, not being actively involved in moving the plot forward, not giving Ella information she doesn’t already have and acting as a sounding board for Ella’s current issues. It’s a common storytelling device because it frequently works so well. Ray Ray is a character who exists for Ella taking on the dual purpose of offering her a sounding board for her current mindset while being someone that the rest of the cast can’t interact with. The only relationship this character has is with Ella -at least at first- and she provides a lot more entertainment possibilities than having Ella simply talk to herself. The episode does play around with the question of whether Ray Ray’s real. Ella assumes that she is otherwise her own sanity would be called into question and that’s not something she’s prepared to deal with though her intellect means that she constantly looks for answers to that question. She asks Ray Ray to speak to the murder victim to provide information before finding out that it isn’t possible then explores the unfinished business angle before finally concluding that she has to just go with it because the answers she needs won’t be forthcoming. Ray Ray is a constantly encouraging presence who points out how skilled and intelligent Ella is. These passive compliments allow Ella to figure out where she belongs and make the right choice about her future. Familial obligation weighs on her heavily as we saw when her brother was introduced but she is also proud of everything she has accomplished independently of them and doesn’t want to be removed from the positive meaningful relationships she has forged in L.A. Ray Ray is quick to point out that her friendship with Chloe is clearly special and encourages her not to lose that. The case of the week might be predictable and typical in a certain sense but the fact that Ella is the one to solve it pretty much by herself is important because it’s a clear sign of her value in her current situation. With Ella as the central character there is plenty of scope to explore dynamics from different perspectives. Seeing Ella arrive at a crime scene and demonstrating how friendly she is to those she works with is new for this show because she is normally already there to offer quippy details about a given dead body. This focus allows a different outlook on her relationship with Chloe who constantly appears sympathetic, warm and friendly to her. Seeing them work together from Ella’s point of view is a solid riff on a familiar dynamic and shows how insecure she is despite being outwardly confident. Ultimately she makes the decision to stay which is definitely the right choice for her and she takes an important step forward in admitting to Chloe that she can see a Ghost that nobody else can see. Chloe is completely understanding and assures Ella that she has seen weirder things while also making it clear that nothing Ella says could change the way Chloe feels about her. It’s a really genuine moment that shows how strong their friendship it. It also has the added bonus of being vague about what Chloe learned in the season finale as her statement about seeing weirder things could simply be a reference to indulging Lucifer’s delusions. Going into more details would make the moment more about Chloe so it was the right decision to keep Ella as the audience perspective. There is a similar if slightly less effective moment closing out the episode when Lucifer tells Ella that he’s glad she’s staying and listens on with interest as she shares specific findings with him. 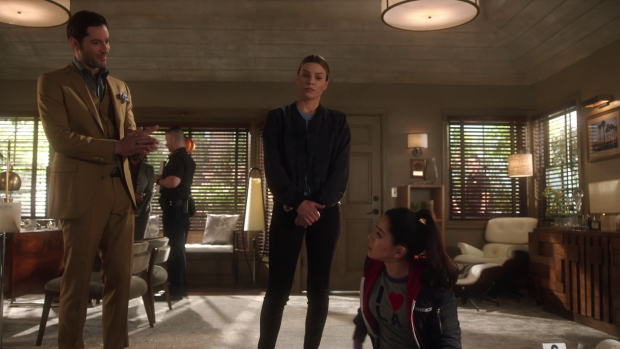 Aimee Garcia delivers her dialogue with boundless excitement and enthusiasm as we have come to expect from Ella and Lucifer listens on intently as a good friend should. It’s a sign of growth from Lucifer in that he’s engaging in a conversation that isn’t about him for the benefit of making someone else feel needed. This provides a taste of what may have defined Lucifer as a character in the fourth season. It turns out that Ray Ray is real but not a Ghost. Considering this is a show featuring Angels and Demons the existence of Ghosts isn’t too far of a stretch though the introduction of this concept would have brought some questions with it around what happens to spirits that don’t go to Heaven or Hell. It wouldn’t be a bad thing to expand the overall mythology but the reveal that Ray Ray is actually Azrael; the Angel of Death sticks to the established mythology. She latched onto Ella because she likes being around her and felt motivated to push her in a direction that would lead her to Lucifer. God’s rules come into play slightly as she talks about being upset that Lucifer was banished so found a loophole that meant she could interact with him in some way. If she can’t do it directly then putting someone she really likes in his path is the next best thing as far as she’s concerned. At first Lucifer is irritated that two of the women in his life have been due to manipulation but backs down when he realises that there was no malicious intent behind it. Whether Azrael was designed to be a one shot character or if the writers had grander plans for her is very difficult to say since there will be no fourth season but she was certainly memorable in this appearance. The episode has a lot of hilarious moments. Dan being outsmarted by Beckett (Madeleine Coghlan) and enlisting Lucifer to help track her down discretely does bring back the more bumbling and unlucky side of Dan but it’s entertaining to see especially when he ends up on a roller-coaster right after establishing that he hates them. Lucifer does his usual and shoots for maximum humiliation by buying everything he can find with the picture taken of him. It’s very typical of their relationship and is undeniably funny. Dan gets his own back to some extent when Beckett manages to outwit him and Maze has to be called in to find her. She revels in their idiocy and helps them because meeting someone who could outwit both of them is something she is very interested in. The main drawback to the Lucifer, Dan and -later- Maze subplot is that it was a misdirect. Beckett wasn’t important to the investigation because she was lying about what she saw. It was basically an excuse to have fun with a delinquent teenager who was capable of eliciting sympathy from Dan and Lucifer before exploiting them when their guard is down. This is a lot of fun as an idea but it felt disjointed when compared to the more relevant Ella story. Both plots felt like they belonged to different episodes so a more tangible and relevant connection would have been better. More relevant and hilarious is Chloe going undercover at a Furry convention. The episode deftly avoids some of the more obvious jokes around this subculture and is quite respectful to those who follow it. Ella is the one to champion the choice people make to pursue it with the humour coming from Chloe being in an uncomfortably warm costume and getting in a fight with someone similarly dressed. It’s a great comedic image that moves the plot forward nicely and allows for some visual variety. There’s a lesson to be learned in this episode and it’s what the title suggests. Ella has always been a character who embraces her inner weirdness and is happy to encourage people to be true to themselves but she still has issues fully committing to that philosophy. Her reluctance to admit that she is able to see a Ghost that nobody else can is a very clear representation of that. Her decision to open up to Chloe about it shows that she now fully commits to her own ideals and feels truly comfortable in her own skin. It’s connected to her decision to stay because her identity is tied to living in L.A. and having friends that fully accept her is a big part of that. 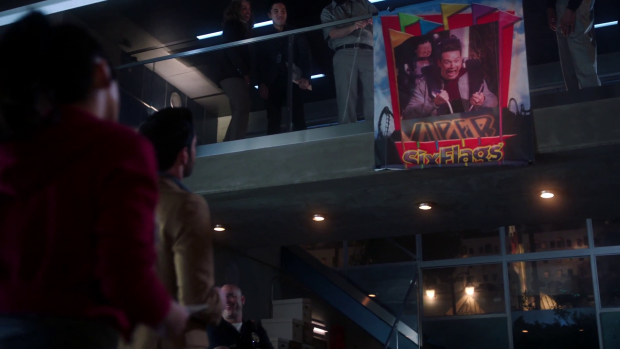 There is also the suggestion that Lucifer could learn a thing or two about embracing his uniqueness rather than constantly running from it but that’s far from the point of the episode. The episode generally shows how much more can be mined from everything this show has set up and makes its cancellation even more frustrating knowing that there is so much more that can be explored. An excellent episode that makes great use of the different perspective offered by focusing on Ella. Her character arc centred on deciding whether she will commit to her life in L.A. or fulfil a familial responsibility is explored wonderfully thanks to her Ghostly friend Ray Ray who constantly encourages her to be true to herself and pays her plenty of compliments about how capable she is. 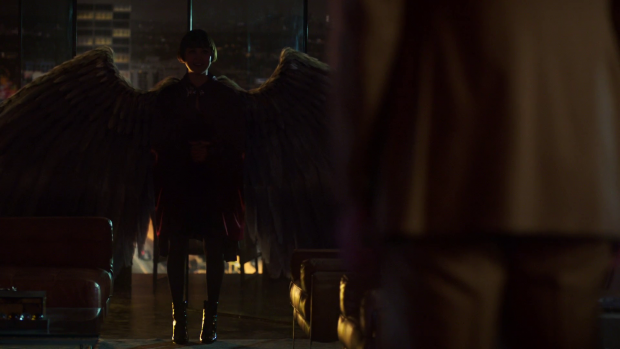 The episode plays with the idea of an imaginary friend really well before delivering the reveal that she is actually Azrael; the Angel of Death and has manipulated Ella into Lucifer’s path because she misses him and really likes Ella so uses that as a loop hole allowing her to be involved in her brother’s life. It’s a good reveal that works in context without undermining the fun connection between Ella and Ray Ray/Azrael. Ella’s perspective allows for unique insight into her relationship with Chloe and pays off nicely when she opens up about interacting with a Ghost therefore revealing her true self to a friend that she trusts. It’s really genuine and endearing before being backed up by Lucifer attentively listening to Ella explain something she’s excited about in order to show how strong that friendship is. The subplot involving Dan, Lucifer and -later- Maze brings a lot of hilarity with the teenage delinquent Beckett successfully outwitting both of them much to Maze’s amusement. This plot could have been better connected to the main story because it feels so divorced from Ella’s plot that it could have been from a completely different episodes. Having it be a red herring brought on by Beckett lying is a nice idea in theory but the execution left a lot to be desired in terms of making the episode fit together. There are more relevant hilarious moments such as Chloe getting into a fight at a Furry convention. It’s a great image that brings some visual variety and deftly avoids some of the obvious jokes that could be aimed at this subculture by having Ella be the one to defend it. There’s also an important lesson to be learned about embracing uniqueness in this episode as Ella definitely demonstrates by fully accepting her weirdness and encouraging others to do the same. It could also be applied to Lucifer himself to some degree though the episode isn’t about him. Episodes like this prove that there is still so much storytelling potential in this show making it even more frustrating that it was cancelled.